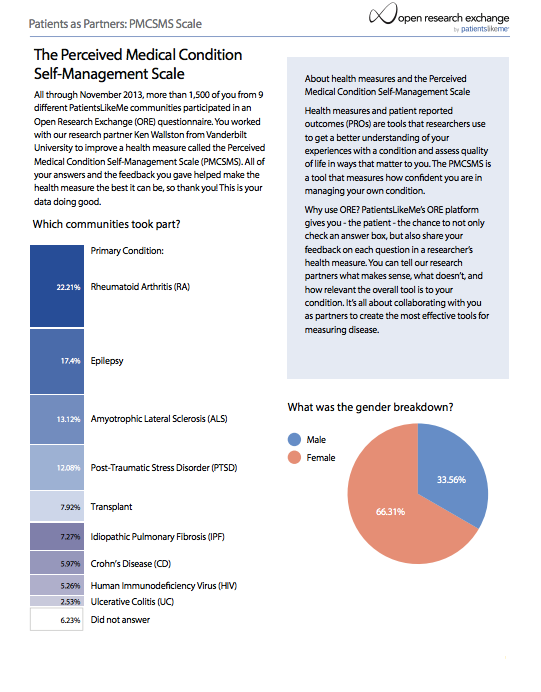 Back at the beginning of April, we launched a new blog series called Patients as Partners that highlights the results and feedback PatientsLikeMe members give to questionnaires on our Open Research Exchange (ORE) platform. This time around, we’re sharing the results of the Perceived Medical Condition Self-Management Scale (PMCSMS), a health measure that looks at how confident people are in managing their own conditions. 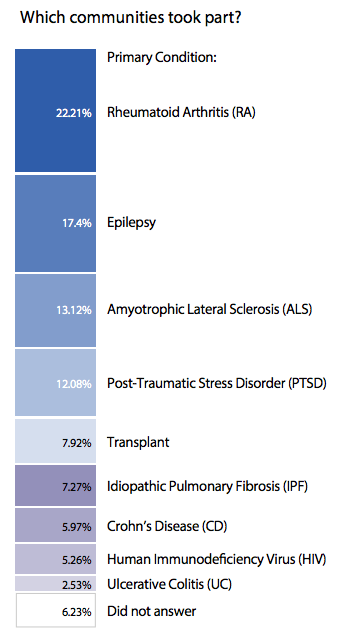 More than 1,500 members from 9 different condition communities on PatientsLikeMe took part. They worked with our research partner Ken Wallston from Vanderbilt University to make the tool the best it can be. (Thank you to everyone that participated! This is your data doing good.) Check out the PMCSMS results and keep your eyes peeled for more ORE questionnaire results as we continue the series on the blog. What’s ORE all about again? PatientsLikeMe’s ORE platform gives patients the chance to not only check an answer box, but also share their feedback on each question in a researcher’s health measure. They can tell our research partners what makes sense, what doesn’t, and how relevant the overall tool is to their condition. It’s all about collaborating with patients as partners to create the most effective tools for measuring disease. Nice work! Have you considered incenting and rewarding Patients as Partners? I would like to see funding included for patients who share their time and information. Researchers, and PLM, are well paid for collecting and aggregating their information. It is incredibly valuable to pharmaceutical companies, which is why your business model is so brilliant and successful. Patients face lots of uncovered costs, and many have lost their ability to work and their incomes. If you developed a cooperative, benefits-sharing business model for ORE, or even just a payment for participation as many clinical trials include, you will see participation rates increase.